If there is one thing about the game today that will wear out Mazzone’s lounger, it’s the increased emphasis on power in pitching. He’s worked with 12-year-olds, who compete against the radar gun as much as the batter, and tried to get through to high school and college hurlers who’ve been taught that a scholarship or professional contract depends more on M-P-H than E-R-A. In the pros, speed is fetishized by teams and fans alike, the reading on each pitch displayed right alongside the score in the corner of the TV, a CG flame occasionally flaring up when a fastball reaches the high-90s or low-100s. Mazzone held that job for more than 27 years, including almost 18 in the big leagues. He attributes his longevity to the success of the pitchers who were indoctrinated with his unorthodox philosophy of actually throwing more often between starts but with decreased intensity, concentrating, instead, on the feel and location of their pitches, controlling the lower outside part of the strike zone — down and away, down and away. The results are well known: In Mazzone’s 15-plus seasons with Atlanta, his staffs led the Braves to 14 straight division championships, combining for four individual ERA titles, nine individual 20-win seasons, six Cy Young Awards, and eventually, three plaques in Cooperstown. Less heralded is the number of careers that were salvaged under Mazzone’s watch and his reputation for taking care of his players — especially the starters, who rarely missed a turn. “Sure he had great pitchers,” says Steve Phillips, who was an executive for the rival New York Mets in the 1990s and early-2000s. “But he kept them on the field. 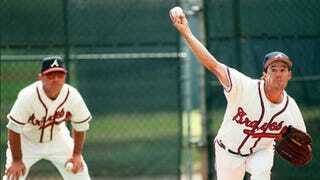 He kept them healthy.” In almost two decades as major league pitching coach, Mazzone only had two starters, John Smoltz and Mike Hampton, play a full season under him and succumb to Tommy John, and they were both approaching their mid-30s.